Last week, “Proclaim the Wonders God Has Done: The Journey of the Evangelical Lutheran Synod“, was selected as an official selection for the International Christian Film & Music Festival, May 1-4 in Orlando, FL. Over 1000 films were submitted, but only a fraction would be selected. And of those, only films nominated for an award would be screened at the festival. Yesterday, the selected films nominated for awards were announced. Unfortunately, “Proclaim the Wonders” was not nominated for an award. This is the second festival the film has been selected for. In December, the film was screened at the God Country Family Christian Film Festival in Eau Claire, Wisconsin. 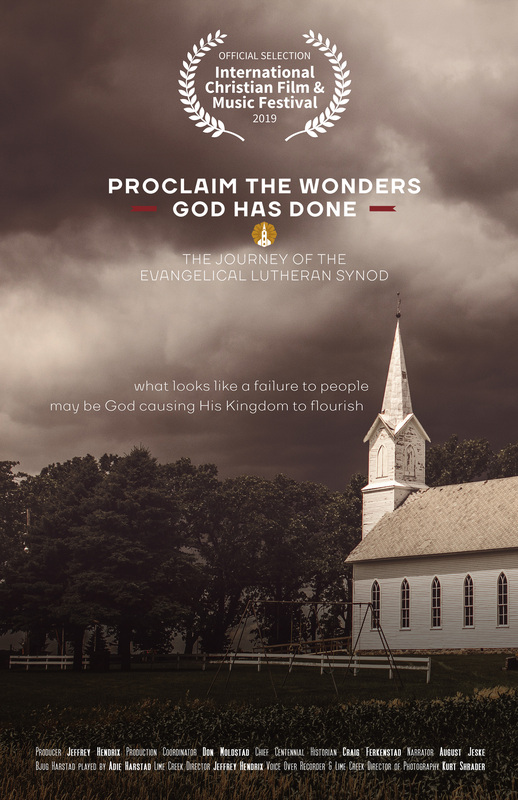 “Proclaim the Wonders” was produced last year to celebrate the centennial of the reorganization of the Evangelical Lutheran Synod. Rev. Jeff Hendrix, who is a newcomer on the CMI Board, served as the producer for the film. In 1917, the Norwegian Synod was one of the largest Lutheran church bodies in America. But by 1918, only a small remnant remained to reorganize their former synod. It looked like a failure, yet this was the beginning of the Evangelical Lutheran Synod (ELS). Embark on a journey through the history of the ELS. Through struggle, hardship, and failure, the journey of the ELS is a testament to the working of God and the growth of the church through hidden means.